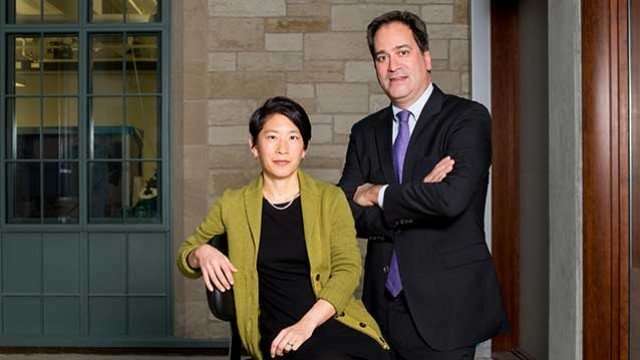 World-renowned nanoscientists and chemists Chad Mirkin, the Director of the International Institute for Nanotechnology (IIN) at Northwestern University, and Teri Odom, the IIN's Associate Director, sit down to discuss the golden age of miniaturization and how the "science of small things" is fostering major advances. The IIN, founded in 2000, is making major strides in nanotechnology and thriving in a big way. Nanoscience and technology—a field focused on studying and manipulating molecules and materials with dimensions on the 1 to 100 nanometer length scale (1 nm = one billionth of a meter)—was anticipated in 1959 by physicist Richard Feynman and made possible with the advent of the electron and scanning tunneling microscopes in the 1980s. It is engaging scientists from all over the world across many disciplines. They are using such tools to explore, and ultimately solve, some of the world's most pressing issues in medicine, engineering, energy, and defense. We sit in on a conversation between Mirkin and Odom to see where this exciting field is headed. Q: Your team discovered spherical nucleic acid (SNA) technology, where tiny particles can be decorated with short snippets of DNA or RNA. With the creation of SNAs, you've basically taken known molecules, reorganized them at the nanoscale into ball-like forms, and changed their properties. What is the potential of such a discovery, and what exciting breakthroughs are on the near horizon? Mirkin: Two really promising areas in which we are applying SNA technology are biomedicine and gene regulation—the idea that one can create ways of using DNA- and RNA-based SNAs as potent new drugs. For example, we can put SNAs into commercially available creams, like Aquaphor, and apply them topically to treat diseases of the skin. There are more than 200 skin diseases with a known genetic basis, making the DNA- and RNA-based SNAs a general strategy for treating skin diseases. Conventional DNA and RNA constructs based on linear nucleic acids cannot be delivered in this way – they do not penetrate the skin. But, SNAs can because of their unique architecture that changes the way they interact with biological structures and in particular, receptors on skin cells that recognize them, but not linear DNA or RNA. SNAs can also be used to treat diseases of the bladder, colon, lung, and eye—organs and tissues that also are hard to treat using traditional means. Odom: We're trying to reduce the size of lasers, which are typically macroscopic devices, down to the nanometer scale. The ability to design nanomaterials that can control the production and guiding of light—which is composed of individual particles called photons—can transform a range of different technologies. For example, communication based on photons (like in optical fibers) vs. electrons (like in copper wires) is faster and much more efficient. Applications that exploit light can readily be transformed by nanotechnology. Q: Nanotechnology has revolutionized the basic sciences, fast-tracking their translational impact. For example, your colleague Samuel Stupp, director of the Simpson Querrey Institute for BioNanotechnology at Northwestern, is on the verge of conducting clinical trials in spinal regeneration through "soft" nanotechnology breakthroughs. Has nanotechnology also revolutionized the traditional scientific method, too? Mirkin: The desire to come up with a solution to a given problem often leads scientists to develop new capabilities. That's the thrilling thing about science in general, but about nanotechnology in particular: we often have goals, which are driven by engineering needs, but along the way we discover fundamentally interesting principles that we didn't anticipate and that inform our view of the world around us. These discoveries take us down new paths—ones that might be even more interesting than the original ones we were on. This is the nature and importance of basic science research. Odom: Nano provides the fundamentals. But then, we adapt, based on these unanticipated properties, while still keeping our long-range goals in mind. That's pretty neat. You can adjust in ways that keep discovery and creativity at the forefront. Without that, we all would be bored. Q: Nobel Prize winner Sir Fraser Stoddart, John Rogers, William Dichtel, Milan Mrksich and Stupp are just a few of the many big names in the Northwestern nanotechnology community. What is Northwestern doing right and what's the global impact? Odom: We have a holistic way of training new faculty and graduate students because we want them to have a complete picture of everything that's going on here. This is how we do science at Northwestern, and we really apply it to nanotechnology. Part of our success as a chemistry department has come from our ability to make things, to measure them, and to model them—I like to think of this integration as the "3Ms" principle. Our achievements in nanotechnology have been built on these three synergistic areas of expertise. Mirkin: It really starts with world-class talent, and then collaboration. You can collaborate all you want, but if you don't have world-class talent, it doesn't matter. Since we're going all-in on the medical side, in 15 years I went from having zero collaborations with the medical school, to now having 17. There is a natural interaction here between clinicians, scientists, and engineers that make everyone's work so much stronger. Within the next five years, I anticipate that there will be cancer treatments based upon nanotechnology that greatly improve outcomes and, in some subsets of diseases, actually leads to cures.